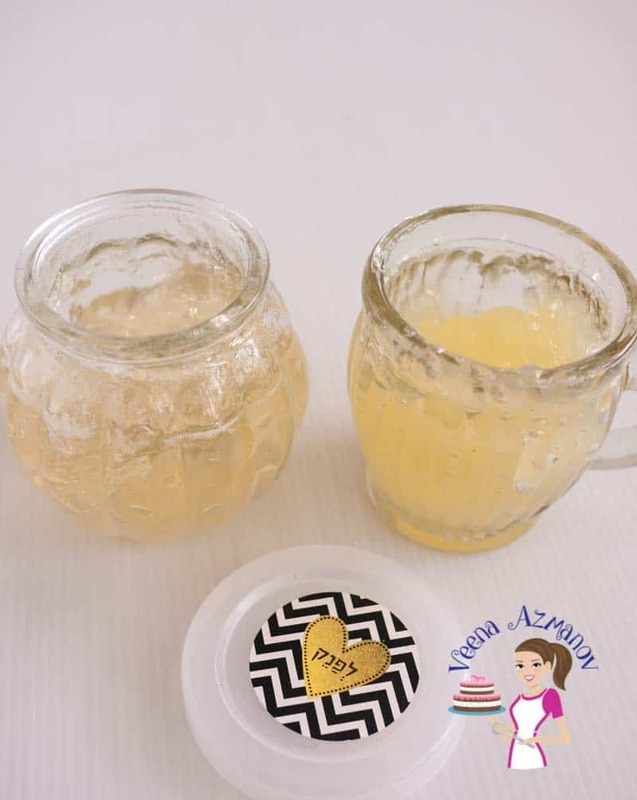 This homemade piping gel so simple, quick and easy to make you will never have to go without it ever again. It has become an important aspect of cake decorating form glue to sticking flowers. 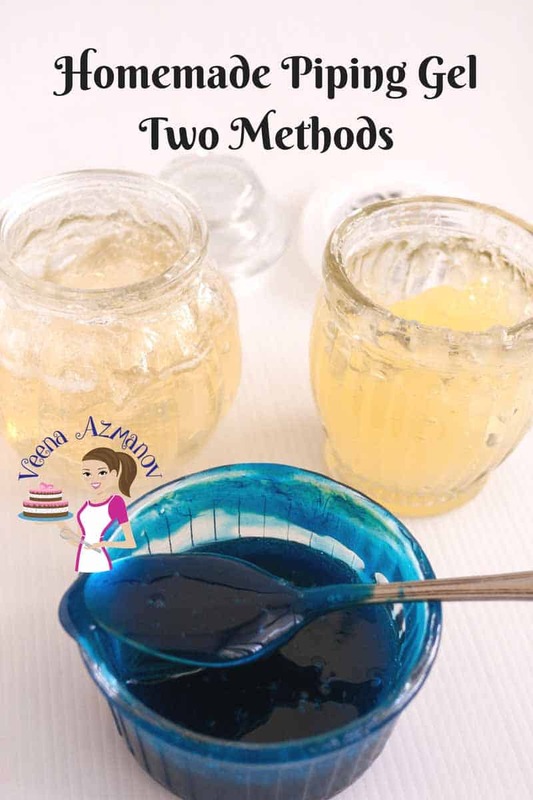 In this post, I share with you two recipes one with gelatin as well as a vegetarian with lots of possibilities. If you are a cake decorator then you must have used piping gel. 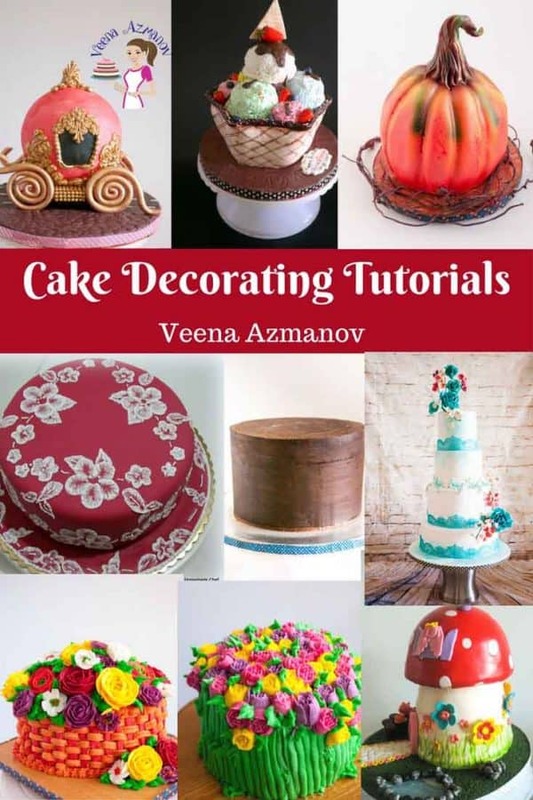 You can find it any cake decorating store. When I started cake decorating it was not very easily available and when I got it the shelf life was always an issue. So I had to find a way to make my own. I found many recipes online and have gone thru quite a few recipes to find what works for me. What do we Use Piping Gel For? Piping gel is often used to give cakes the glass effect such as stain glass cakes. When you need to create water for a swimming pool cake or the water for the waterfall. When working with wafer paper flowers. Piping gel works best to stick wafer paper to wafer paper. As glue when working with sugar cookies. I use piping to get the too sick fondant to my cookies. I won’t say that this is my original recipe – more like adapted from those found online. I’ve gone thru a couple of piping gel recipes and come up with this ratio of gelatin or cornstarch that work best for me. I hope you will find it useful too. The main difference, of course, is one is made using gelatin and one is made with cornstarch. Which means one is vegetarian and the other is not. But as you can see there is also a slight difference is color. This one is made with cornstarch and it’s a bit more opaque. While it’s not a huge difference I think it’s worth mentioning. Understanding the consistency of the piping gel is very important. It’s soft consistency and does not dry hard. It will dry but not like royal icing so please do not mistake it for royal icing. You may need to add hot water to bring to the piping gel to the consistency you need. Below is the piping gel consistency when made. It would work great to create water or waves where you need it to hold share. But if you need it as glue this might be thick so add a few tablespoons of hot water and mix thoroughly. I find that it’s best to store piping gel in a little glass jar like the ones I show you here. I always keep it in the fridge to increase its shelf life. In general piping gel has a short shelf life – I’d say about 2 weeks. So I always make a small batch and prefer to make it often. If you are using any recipe it best to first do a test to see if it’s the right one for the project on hand. Whatever recipe you use be it the one with gelatin or with cornstarch if you do not make it the same way I have it may not work for your project. Please test it to see if it can create those waves or that waterfall you want and make adjustments. As you can see in the images above this how it looks when I made it. I hope it works for you too. I personally prefer to use this recipe though it is a bit more expensive than the second recipe. It dries better than the second recipe and I personally think the gelatin and corn syrup is tastier. If you are a vegetarian then you probably need to see the second recipe below. 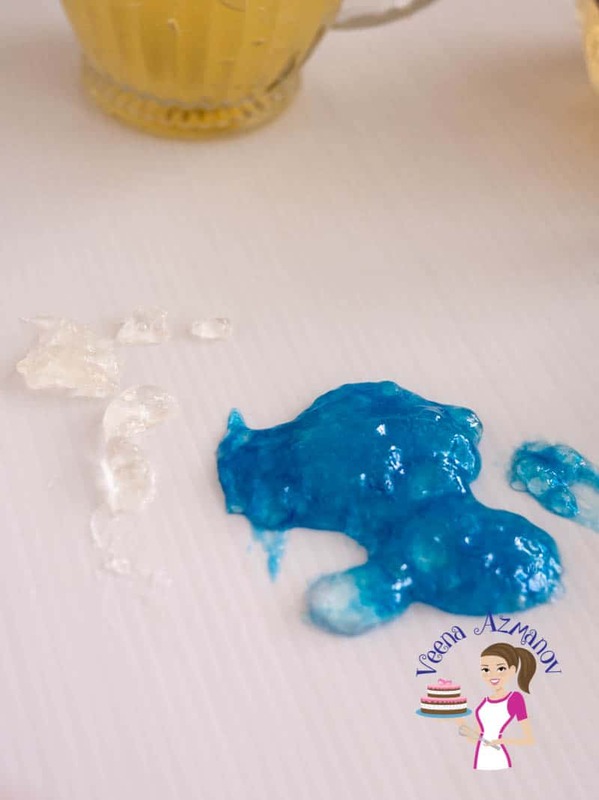 Dissolve gelatin in the water for 2 minutes. 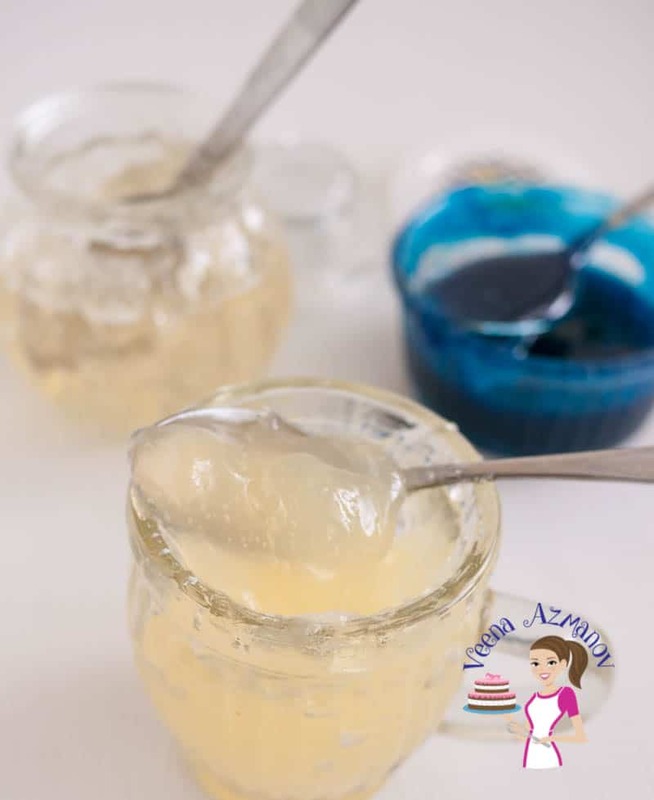 Place in the microwave for 20 to 30 seconds or in a double boiler and melt the gelatin. Place the corn syrup and extract in a saucepan over low heat. Once the corn syrup is hot add in the gelatin mixture. That’s it – your piping gel is ready. This gel will thicken as it sits. The benefit of this recipe is that it is cheaper. I personally do not like the taste of strong lemon but it does go nice and smooth so you get a nice glass effect. Dissolve the cornstarch in half the water. 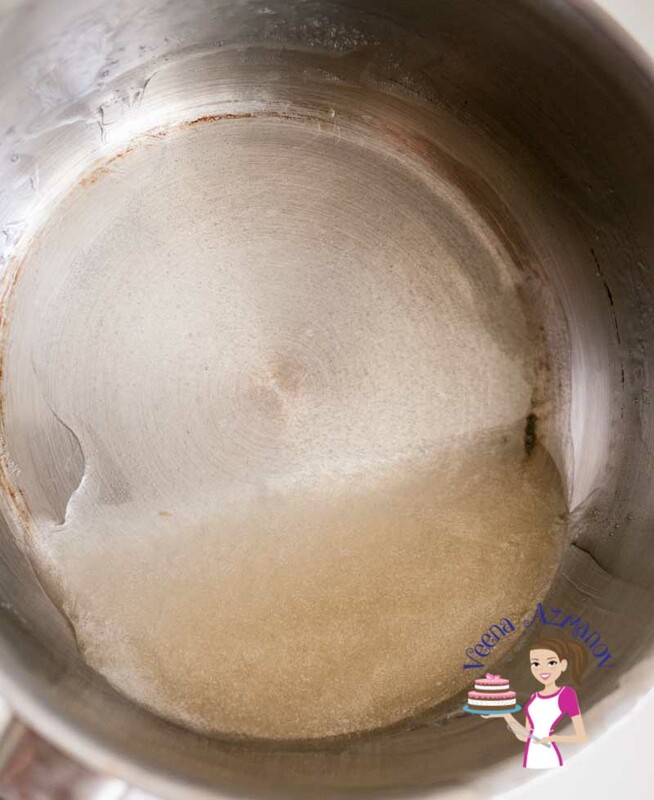 Place the sugar, remaining water on low heat and stir until all the sugar has dissolved. Add the lemon juice, cornstarch mixture. Stir until thick and opaque. The cornflour should cook until it becomes opaque (see image below). Store in a glass jar or container. Once cooled use as desired. If necessary add hot water to bring to the right consistency. Important – Cook this Homemade Piping Gel until cornstarch looks like this. Almost translucent. That's it - your piping gel is ready. Thanks a lot for the recipe! Can you please tell me if I can use this piping gel on buttercream frosting? Or will it get soaked up by the buttercream? I made this last week for a waterfall cake. Thank you so much. They ran out of piping gel at the store. I didn’t know you could make this at home. Thank you so much for sharing. Thank you, Andrew. So happy you found this tutorial and recipe useful. Thank you so much for coming back to write this feedback. Have a wonderful day. What I have here is piping gel used for cake decorating Sim. 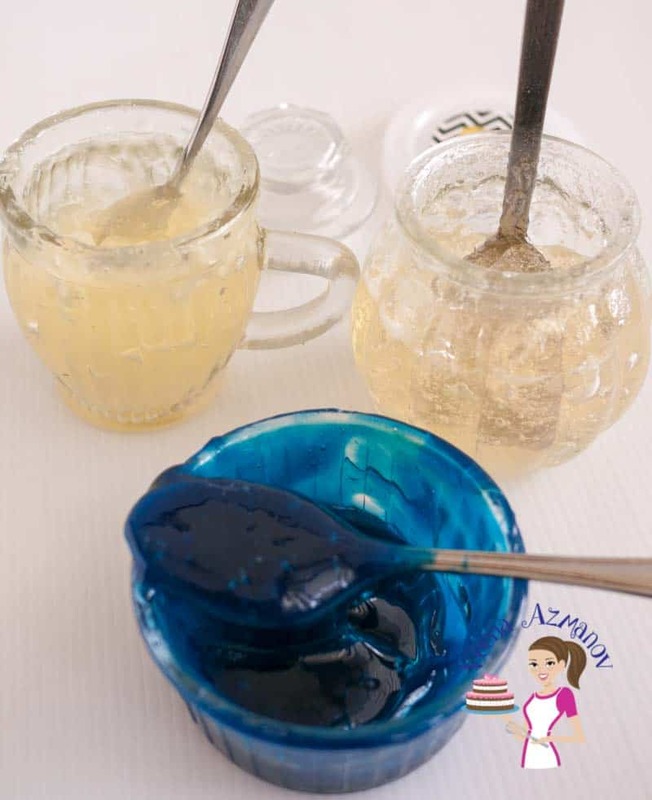 The gel used for cakes is similar just not so thick in consistency. If you want to glaze fruits on tarts and such you will need to add more water or keep it thicker. Consistency is key. Hi Veena, I am a bit confused.. what’s the difference between piping gel and confectioners glaze. Are they the same?? I googled but I’m not getting the right answer. Thank you for sharing this. I do not find piping gel here so have to make my own. Thank you, Sonny. So happy you have success with this recipe and find it useful. Thanks for coming back to leave this feedback. Have a wonderful week. I replaced the lemon juice with dole pineapple juice, it tastes really good. Awesome! That does sound so delicious. Can we make chocolate gel with starch? I think if you add cocoa powder with the cornstarch to the piping gel it will work but I have not tried. i’m trying to make a Moana cake and want to use the gel for the sea. some earlier posts say the gel was absorbed..would a buttercream crumb coat avoid this? I put buttercream icing on cake then coated it with homemade gel. Later I put fondant decorations around cake & they all melted.I made a cake last week with a river & fondant fisherman in water & grass &fish were fine. What did I do wrong? How long does the cornstarch recipe take to thicken? Mobs is opaque, but jkot thick at all and I followed the recipe exactly. Thank you so much for your time and expertise! Hi Amber. You do want it to thicken until it’s really opaque not white. Just as you can see in the pictures I shared. You want it thick and if necessary add a few tbsp of water to bring to consistency. Veena, thank you for sharing these recipes. I have a question about the gelatin. 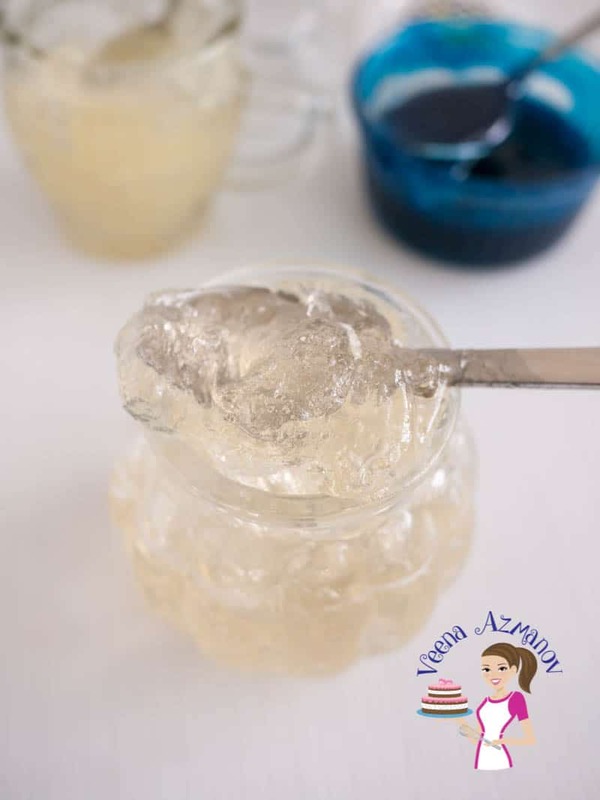 Will kosher gelatin (made with fish pectin) work? Yes Wendy. I have made this with Kosher gelatin and it works fine. NO this is not the same as mirror glaze. You can use this recipe for mirror glaze. Hi, I tried my piping gel on a cake to act as a lake. The back absorbed the liquid, is there a way around this? Yes it is soft liquid so if you place it on fondant it will get absorbed. You can try using by placing a piece gumpaste first. dry it off so it nice and stiff or perhaps royal icing. But have not tried it. Ideally it’s sugar and liquid so it’s bound to get absorbed. Hi veena, i tried your recipe but we don’t have corn syrup and gelatine so i use agar agar and granulated sugar. And as of now looks fine…. I will let you know when it is complety sit. Thanks. Ah I didn’t know it would work with Agar Agar or not.. so happy to hear it’s fine. Thanks for sharing. Thank you Veena for sharing your recipe. Can i replace gelatin with agar powder? 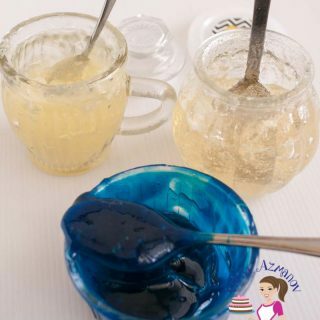 I have not tried agar agar yet Rachana.. I’m thinking agar agar may make it stiffer… Try and let us know if it works. Thank you, Micheal. Thank you so much for sharing. Love this tip. he he.. know what you mean.. well, form us simply… Corn syrup and glucose syrup are more or less the same in terms of usage. corn syrup is usually more liquid while glucose in thicker so you have to use a few tsp of water to dilute. Often we use one for the other and it works like in this recipe or in fondant recipes. I have not tried it with glucose syrup so not sure if it will work. Let me know the outcome if you try. Hi, thanks for sharing. I want to make one of them, but I need the pool to be on top of a cake which I frost with vanilla cream. Not butter frosting but similar (made of heavy cream and pudding), can I spread it on top of the cream?? yeah I think you can… I’ve not done it but if you make it thick should be ok. I want a recipe for gumpaste. Also I have a problem.. When I add red colour to the gumpaste it turns pink. How can I get proper red(Christmas red).. Please help me..
Can i make this ahead and put in fridge before using it to decorate? Homemade Piping gel has a short shelf life. I would say two weeks. Can food coloring gel be added to this recipe and at what point is it added? I think you can use glucose too but I have not tried it yet. Can i use a high fructose corn syrup? I am LOVING your tutorials! So glad I found this site! Question on your piping gel recipe: how much vanilla extract do you use & when do you add it? Thanks in advance! You can add it at the end or in between – either is ok. Thanks a lot veena for sharing your recipe. This is a big help for me. Salamat. Thanks a lot Veena for this recipe. Thanks a lot. Very nicely explained tutorial . thank you for your tutorials I love them.! Not sure I understand your question. But this is to be use as glue, to make water effects and such. You can also do stained glass effect. BUt no it is not frosting or filling so do not use it as that. you can buy 'KARO Light Corn Syrup' from Tesco [£3.50] it will be in the international food isle [America] BUT, having googled for a substitute you can use GOLDEN SYRUP and if i'd've known that I would have used it..
Golden syrup is golden. Corn Syrup is clear. If you use golden syrup the gel will not be clear. Yes, I have used corn syrup not golden syrup? Sorry what is your question? Feel free to ask again. instead of corn syrup, try using glucose syrup. I’m in New Zealand and have found corn syrup in a specialty store, 4oz for about $7.00, so I’m going to try with glucose syrup. Can I use glucose gel in place of corn syrup? Hi I was wondering is there I can use something to replace corn syrup with- glycerol, honey….? What can i use to replace the lemon if i do not want to use it? You can add the food coloring when it is still hot. it makes it easier to mix as it is still at a runny consistency. once it cools off, it thickens more. you can still do it when it is cold, just mix well. Also, go one drop of coloring at a time. one drop goes a long way; it does not take much. Why are you using corn oil? It's corn syrup…! Hi just wanted to ask if I can use china grass powder as I cant use gelatin and the only suitable for vegetarians are in a sheet so not sure how many to use? 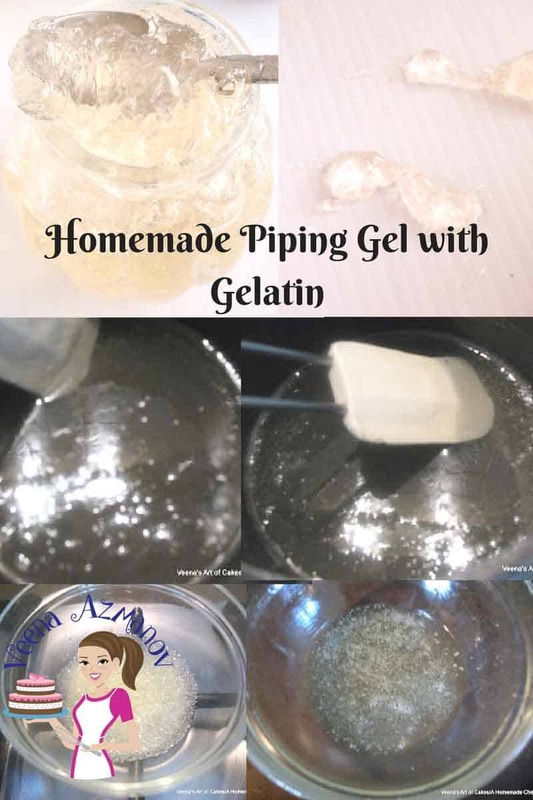 Thanks for the piping gel info.I used to get confused about the recipe but now i am sure i can make one..
Hi veena is piping gel and neutral gel are same. Hi Sejal… not sure what is neutral gel..!! Not heard of it.